In this economy, there aren’t too many second chances. But if you’re a corporate titan, fortune may smile on you more than once, even if you damage your firm or even imperil its existence. The last several years have been tumultuous in corporate America, as a financial crisis rippled through the economy and other disasters brought shame upon once-admired firms. The recession that coincided with the financial crisis has cost the U.S. economy about seven million jobs and left the whole nation slogging through a weak, unconvincing recovery. Yet a number of disgraced CEOs and other grounded high-flyers have fared surprisingly well, either landing plum jobs with new employers or securing golden parachutes that guarantee a luxurious retirement–or both. That’s not always the case. In his 2004 book Why Smart Executives Fail, Dartmouth professor Sydney Finkelstein found that of 51 “failed” CEOs, only two ever got hired again by an existing firm. The rest started their own firms, became consultants, or slunk into retirement. Today, by contrast, companies seem more willing to hire executives with black marks on their resumes. Martin Sullivan, former CEO of AIG. Sullivan replaced longtime AIG chief Hank Greenburg in 2005, and presided over many of the decisions that led to the insurance giant’s collapse in 2008, the year he was forced out. Under Sullivan’s watch, for instance, AIG issued billions of dollars’ worth of insurance on highly risky mortgage-related derivatives, which left AIG seeking the biggest bailout in corporate history when those derivatives plunged in value and AIG was unable to honor its commitments. Where he is now: British insurance firm Willis Group named Sullivan its deputy chairman last year and put him in charge of a new global-services division. Research site Footnoted.com reports that Sullivan will earn a base salary of $750,000 and be eligible for a 2011 bonus of more than $1 million. If he stays for three years, he’ll also be able to cash in company stock worth at least another $4 million. Tony Hayward, former CEO of BP. Hayward’s three-year tenure atop the British oil giant ended in 2010, following the Deepwater Horizon disaster in the Gulf of Mexico, which killed 11 workers, fouled the Gulf with oil, and forced BP to set aside a whopping $41 billion for cleanup, litigation, penalties, and other costs. Hayward got a year’s salary when he left–about $1.7 million–and held onto BP stock that could be worth millions more. Where he is now: Hayward recently launched a new energy firm in the U.K. called Vallares, which raised more than $2 billion in a public offering. The firm plans to use that money to buy and operate energy firms in emerging markets. Mark Hurd, former CEO of Hewlett-Packard. After five years as HP’s top honcho, Hurd’s career seemed to quickly unravel in August 2010 after allegations surfaced of misconduct relating to a personal relationship. Hurd abruptly resigned, with a $12.2 million cash payout from H-P and stock options worth $30 million more, according to the Associated Press. A shareholder lawsuit against H-P–which is still ongoing–argues that the technology giant overpaid the departing CEO. Where he is now: A month after Hurd left H-P, Oracle hired him as president, with pay that could top $10 million per year. Stanley O’Neal, former CEO of Merrill Lynch. O’Neal spent much of his career at Merrill Lynch and became CEO in 2002, presiding over the company as it began to place huge bets on subprime mortgages and risky derivatives that generated billions in losses, nearly sank the firm, and led to a takeover by Bank of America in 2008. In 2006–the year Merrill made many of the deals that led to its downfall–O’Neal earned $91 million, according to the Financial Crisis Inquiry Commission. When O’Neal resigned in 2007, Merrill gave him a severance package worth another $161 million. Where he is now: In 2008, after O’Neal left Merrill, Alcoa named him to its board of directors. Dow Kim, former head of global markets and investment banking for Merrill Lynch. From 2003 to 2007, Kim oversaw a vast increase in the amount of collateralized debt obligations Merrill created and sold, eventually making Merrill the No. 1 Wall Street issuer of these controversial derivatives tied to mortgages, according to the FCIC. Those CDOs eventually led to billions in losses and severely weakened the firm. Kim left Merrill Lynch in the middle of 2007–shortly before its losses began to mushroom–receiving more than $35 million for his work in 2006, according to the FCIC, a paycheck second only O’Neal’s during that fateful year. Where he is now: After leaving Merrill Lynch, Kim tried to start a hedge fund, which struggled to attract investors amidst the 2008 financial crisis. Charles Prince, former CEO of Citigroup. Like Stan O’Neal at Merrill Lynch, Prince spent his four years as CEO of Citi trying to capitalize on the boom in subprime mortgages and exotic derivatives linked to them. He resigned in 2007 as those risky bets began to unravel, leading to gargantuan losses that would ultimately require a $45 billion government bailout (which Citigroup later repaid). Citi gave Prince a severance package worth $36 million when he left, on top of the $43 million he had already earned as CEO, according to the FCIC. Where he is now: Keeping a low profile. Thomas Maheras, former co-CEO of Citigroup’s investment bank. Maheras helped catapult Citigroup from a bit player in the market for lucrative but risky CDOs into one of the world’s top originators, along with Merrill Lynch. He resigned from Citigroup in October 2007, as the securities his division created began to lose value and generate losses that would eventually overwhelm Citi. Maheras earned more than $34 million for his work at Citi in 2006, his last full year at the bank, according to the FCIC. Where he is now: In 2008, Discover Financial Services named Maheras a director. He also started a private investing firm called Tegean Capital Management. Jeffrey Peek, former CEO of CIT Group. Peek arrived at CIT in 2003 and began to convert the sleepy, small-business lender into a broader financial-services firm with expanded portfolios of student loans and subprime mortgages. That turned out to be a bad move, needless to say, and CIT declared bankruptcy in 2009, with Peek resigning shortly afterward. Peek earned about $27 million at CIT through 2008, according to Forbes, but CIT’s acceptance of $2.3 billion in government bailout money prevented him from claiming a severance package when he resigned. Peek’s wife Liz, meanwhile, famously wrote the anonymous “Confessions of a TARP Wife” for Portfolio, which turned out to be a deep embarrassment when her identity as the author was revealed. CIT’s bankruptcy filing meant taxpayers were out the $2.3 billion they had extended to the firm. Where he is now: Last year Barclay’s hired Peek to be one of its top investment bankers. John Thain, former CEO of Merrill Lynch. Thain’s illustrious Wall Street career seemed impeccable until he replaced Stan O’Neal as Merrill Lynch’s CEO in 2007. Thain tried in vain to keep Merrill’s losses under control, finally guiding the crippled firm into the arms of Bank of America in 2008. That may have been inevitable, but Thain drew criticism for several events under his watch, including a million-dollar renovation of his office (which he ultimately paid for himself) and $3.6 billion in bonuses granted to Merrill bankers during a year in which the firm nearly collapsed and required federal bailout money to survive. Thain, once thought to be a contender for the top job at the new Bank of America, was instead forced out of the merged firm in early 2009. Where he is now: A year after Thain left Merrill Lynch, Wall Street’s revolving door ushered him into the top job at CIT, which had emerged from a prepackaged bankruptcy. His pay at CIT: $6 million per year in cash and stock, plus an annual bonus of up to $1.5 million. Steven Newman, CEO of Transocean. Newman enjoyed a rewarding year in 2010, even though his firm’s Deepwater Horizon oil-drilling rig–which was leased to BP–blew up on April 20, 2010, killing 11 workers and triggering the huge oil spill into the Gulf of Mexico. Newman had taken over as Transocean CEO barely a month earlier, yet he had been president of the firm before that, and Transocean awarded him $5.8 million in total compensation for 2010. Newman’s pay included a “safety bonus” of nearly $100,000, which he earned because Transocean “achieved an exemplary statistical safety record as measured by our total recordable incident rate,” according to a company filing with the SEC. After an uproar, Transocean said its top executives would donate their safety bonuses to a memorial fund for the families of the 11 workers killed in the Gulf explosion. Research firm GMIRatings points out that Transocean also gave its outgoing CEO, Robert L. Long–who left right before the Gulf disaster–an exit package worth about $21 million. Where he is now: Still CEO of Transocean. Don Blankenship, former CEO of Massey Energy. Blankenship and the firm he had run for two decades became enormously controversial after a gas explosion at Massey’s Upper Big Branch coal mine in West Virginia on April 5, 2010, killed 29 miners. The explosion came after inspectors had repeatedly cited Massey for safety violations at the mine, and it impaired the company’s profitability. Massey swung from a $104 million profit in 2009 to a $167 million loss in 2010, and subsequently merged with Alpha Natural Resources. The combative Blankenship endured a 2010 pay cut of more than 40 percent, but as Footnoted.com pointed out, he also got a $14.4 million severance package, plus a $7 million pension and $32.1 million in deferred compensation. It’s good to be CEO. Even a dethroned CEO. Where he is now: Retired. See how destructive we can be! Big Oil is holding its breath. BP’s shares are in steep decline after the debacle in the Gulf of Mexico. Barack Obama, the American people and the global environmental community are outraged, and now the company stands to lose the rights to drill for oil in the Arctic and other ecologically sensitive places. The gulf disaster may cost it a few billion dollars, but so what? When annual profits for a company often run to tens of billions, the cost of laying 5,000 miles of booms, or spraying millions of gallons of dispersants and settling 100,000 court cases is not much more than missing a few months’ production. It’s awkward, but it can easily be passed on. The oil industry‘s image is seriously damaged, but it can pay handsomely to greenwash itself, just as it managed after Exxon Valdez, Brent Spar and the Ken Saro-Wiwa public relations disasters. In a few years’ time, this episode will probably be forgotten — just another blip in the fortunes of the industry that fuels the world. But the oil companies are nervous now because the spotlight has been turned on their cavalier attitude to pollution and on the sheer incompetence of an industry that is used to calling the shots. Big Oil’s real horror was not the spillage, which was common enough, but because it happened so close to the US. 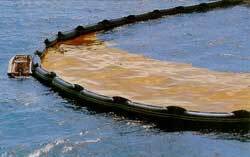 Millions of barrels of oil are spilled, jettisoned or wasted every year without much attention being paid. There are more than 2,000 major spillage sites in the Niger delta that have never been cleaned up; there are vast areas of the Colombian, Ecuadorian and Peruvian Amazon that have been devastated by spillages, the dumping of toxic materials and blowouts. Rivers and wells in Venezuela, Angola, Chad, Gabon, Equatorial Guinea, Uganda and Sudan have been badly polluted. Occidental, BP, Chevron, Shell and most other oil companies together face hundreds of outstanding lawsuits. Ecuador alone is seeking $30bn from Texaco. The only reason oil costs $70-$100 a barrel today, and not $200, is because the industry has managed to pass on the real costs of extracting the oil. If the developing world applied the same pressure on the companies as Obama and the U.S. senators are now doing, and if the industry were forced to really clean up the myriad messes it causes, the price would jump and the switch to clean energy would be swift. LONDON (Reuters) – BP, which faces U.S. opposition to drilling for oil in the Gulf of Mexico, named fields there that it will use to help finance its $20 billion fund for victims of the worst oil spill in U.S. history. The oil major on Friday said it would channel revenue from a number of its fields in the Gulf, including Thunder Horse, Atlantis and Mad Dog, into its compensation fund. “It’s quite a clever thing that BP’s done which is, here are our deep water Gulf of Mexico assets, and we’re pledging overriding royalties as collateral which should suggest to the U.S. administration not to in any way meddle with these facilities,” said Seymour Pierce analyst Alan Sinclair. There have been concerns that the U.S. could ban BP from future drilling after lawmakers in July voted to pass an amendment to a bill that would prevent BP from acquiring new exploration leases after the blow-out at its Macondo well in April. A BP spokesman declined to comment on whether the move means the U.S. government has told BP, or the company expects, it will not be banned from future drilling. Shares in BP gained 2.9 percent to 440 pence at 7:02 a.m. EDT on Friday, their highest level since early June, outperforming Britain’s blue-chip index, which was up 0.6 percent and slightly ahead of the European index of oil and gas companies which was up 2 percent. Another analyst, who did not wish to be named, noted that BP is planning to sell $30 billion of assets and said the deal between Chinese refiner Sinopec and Spanish oil major Repsol, announced earlier could be driving market optimism on asset prices. “Repsol’s got a very good price for some of its assets today so maybe people are getting hopeful on that,” he said. BP also said on Friday that the total bill for fighting the spill and compensating victims hit $11.2 billion by September 29, rising from $9.5 billion on September 18. The pledging of the assets is in line with the terms of the fund set out in August, when BP agreed to give the fund first priority to some oil revenues to finance its $5 billion contribution this year and the $1.25 billion every quarter from 2011 to 2013. The cap would be just a temporary solution, but it offers the best hope yet for cutting off the crude that has fouled the Gulf since theDeepwater Horizon rig leased by BP exploded April 20, killing 11 workers. Allen and BP officials repeatedly cautioned there are no guarantees about the delicate work a mile below the sea. Allen urged Gulf Coast residents watching the possible fix evolve to be patient. “They ought to be interested and concerned but if they hold their breath, they’ll run out of oxygen. I won’t be,” Allen told The Associated Press after the briefing. The tests could last anywhere from six to 48 hours, Allen and BP said. Kent Wells, a senior vice president at the oil giant, declined to talk about BP’s next steps until the test results are in hand. “It’s not simple stuff. What we don’t want to do is speculate around it,” Wells said in a BP news briefing. The cap’s installation after three days of undersea preparations was good news to weary residents of the coast from Texas to Florida, who have waited for BP to make good on its promise to clean up the mess. Still, even if the oil is stopped, the consequences are far from over. 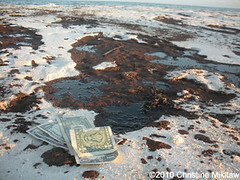 Residents skeptical if BP can deliver on its promise to control the spill greeted the news cautiously. “There’s no telling what those crazy suckers are going to do now,” Ronnie Kenniar said when he heard the cap was placed on the well. The 49-year-old fishermen is now working in the Vessel of Opportunity program, a BP-run operation employing boat owners to lay boom, ferry coast guard officers and deliver supplies. The oil giant immediately began readying its next attempted fix, using robot submarines to cut the pipe that’s gushing the oil into the Gulf of Mexico and cap it with funnel-like device, but the only guaranteed solution remains more than two months away. The company determined the “top kill” had failed after it spent three days pumping heavy drilling mud into the crippled well 5,000 feet underwater. It’s the latest in a series of failures to stop the crude that’s fouling marshland and beaches, as estimates of how much oil is leaking grow more dire. The spill is the worst in U.S. history _ exceeding even the 1989 Exxon Valdez disaster _ and has dumped between 18 million and 40 million gallons into the Gulf, according to government estimates. Frustration has grown as drifting oil closes beaches and washes up in sensitive marshland. The damage is underscored by images of pelicans and their eggs coated in oil. Below the surface, oyster beds and shrimp nurseries face certain death. Fishermen complain there’s no end in sight to the catastrophe that’s keeping their boats idle. News that the top kill fell short drew a sharply worded response from President Barack Obama, a day after he visited the Gulf Coast to see the damage firsthand. “It is as enraging as it is heartbreaking, and we will not relent until this leak is contained, until the waters and shores are cleaned up, and until the people unjustly victimized by this manmade disaster are made whole,” Obama said Saturday. In the days after the spill, BP was unable to use robot submarines to close valves on the massive blowout preventer atop the damaged well, then two weeks later ice-like crystals clogged a 100-ton box the company tried placing over the leak. Earlier this week, engineers removed a mile-long siphon tube after it sucked up a disappointing 900,000 gallons of oil from the gusher. In the latest try, BP engineers pumped more than 1.2 million gallons of heavy drilling mud into the well and also shot in assorted junk, including metal pieces and rubber balls. The hope was that the mud force-fed into the well would overwhelm the upward flow of oil and natural gas. But Suttles said most of the mud escaped out of the damaged pipe that’s leaking the oil, called a riser. The company plans to use robot submarines to cut off the damaged riser, and then try to cap it with a containment valve. The effort is expected to take between four and seven days. “Everybody’s starting to realize this summer’s lost. And our whole lifestyle might be lost,” said Michael Ballay, the 59-year-old manager of the Cypress Cove Marina in Venice, La., near where oil first made landfall in large quantities almost two weeks ago. Johnny Nunez, owner of Fishing Magician Charters in Shell Beach, La., said the spill is hurting his business during what’s normally the best time of year _ and there’s no end in sight. Associated Press Writers Matthew Brown, Janet McConnaughey and Mary Foster in New Orleans and AP Radio correspondent Shelly Adler contributed to this report.